Italian cuisine is one of my favourites, I love the flavours and ingredient combinations. I can cook pasta…and that’s about it. It is time to try something else other than pasta. Unless I have a lot of time, I am always looking for recipes that require simple ingredients and instructions, that way I don’t need to buy ten different ingredients to make one dish and I can make the recipe without breaking a sweat. Lidia’s Favorite Recipes is one of those cookbooks that contain easy-to-understand recipes that require simple ingredients. It is divided into nine sections containing appetizers, sauces, to desserts. The book is really nicely designed (my graphic designer part of me coming out) with beautiful photography that represents Lidia’s style of Italian food – simple and comforting. Lidia is the author of eight previous cookbooks, she is also a cooking show host, specializing in Italian and American-Italian cuisine. This cookbook in a compilation of her personal favorite recipes – 100 Foolproof Italian Dishes, from Basic Sauces to Irresistable Entrees. 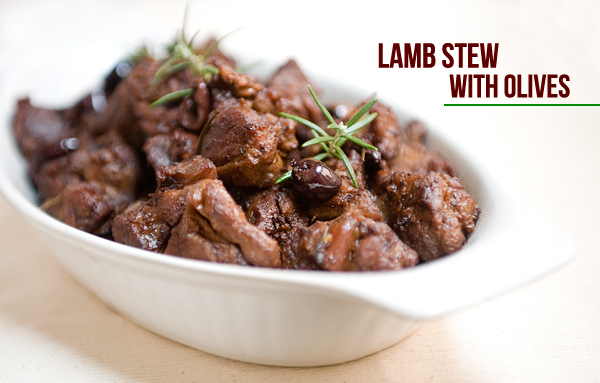 Since I wanted to try something different, in this post I am going to share a lamb recipe from this cookbook, Lamb Stew with Olives – it is easy to prepare and quite tasty. Trim the exterior fat from the lam shoulder or leg, and cut the meat into 2-inch pieces, removing fat and bits of cartilage as you find them. Pat the pieces dry with paper towels, and season all over with half the salt. Stir the wine and vinegar together, and pour them into the skillet, swirling them with the pan juices. Bring the liquids to a boil, and cook them down quickly to form a syrupy sauce. Drop the olives into the pan, all around the lamb chunks, then cover, and adjust the heat so the liquid maintains a bubbly simmer. Cook for another 10 minutes or so, which will concentrate the juices and marry the flavors. Cook uncovered for a few final minutes, tumbling the meat and olives in the pan, coating them with the sauce. Serve right from the skillet, or heap the meat chunks on a platter or in a shallow serving bowl. Spoon out any sauce and olives left in the pan, and drizzle over lamb. 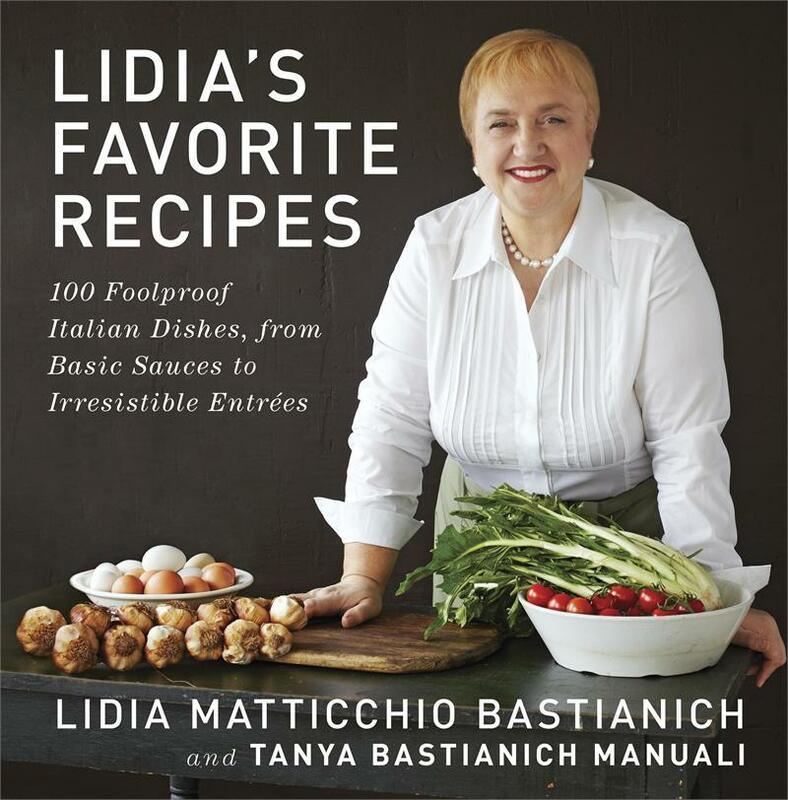 Excerpted from Lidia's Favorite Recipes by Lidia Matticchio Bastianich and Tanya Bastianich Manuali. © 2012 Alfred A. Knopf. 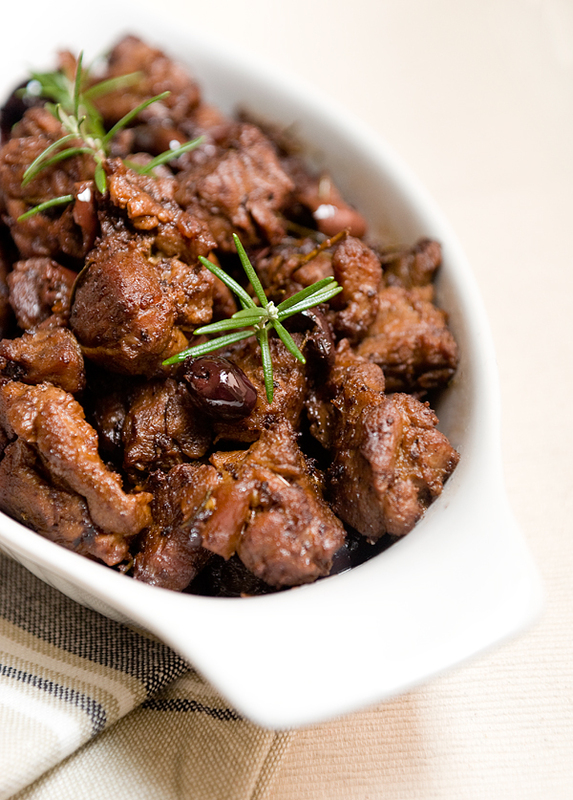 I enjoyed this dish, the olives were very flavourful with the lamb chunks. I initially thought that lamb (I used lamb shoulder) might be tough, but it wasn’t at all, it was not very tender but had a good texture. I had my lamb with some quinoa and vegetables and it was quite hearty. As noted in the cookbook, it was very easy to prepare and flavourful. I recommend trying this recipe, it is something different yet not complicated at all.